Our range of products include label thermal shrink packaging machine and shrink tunnel packaging machine. Label Thermal Shrink Packaging Machine is a necessary equipment a manufacturing company would install during its beginning, Which is rather a tough task when executed manually. Having a packaging machinery saves the time as well as labor cost. Our company is specialized in fabricating many packaging machineries, label thermal shrink packaging machine is one of them. It is used to apply shrink films on cans, rolled steel, appliances, bottles, etc when these are passed through the shrink room on moving conveyor. The controls are there to set the air velocity, temperature and conveyor speed. The thermal shrink packaging machine is sturdy, that consumes the low energy of 8 KW and also works very quickly and its conveyor speed is 0 to 10 m per min. We are engaged in the export of operationally fluent Shrink Tunnel Packaging Machine that can be availed in several models to cater to the varied client needs. 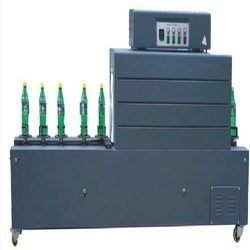 Widely used for shrink wrapping boxes, pharmaceutical products, jewelry, stationery items and other products, these machines are high in demands. Compact and robust in nature, these heavy duty machines make use of high-quality heating elements.